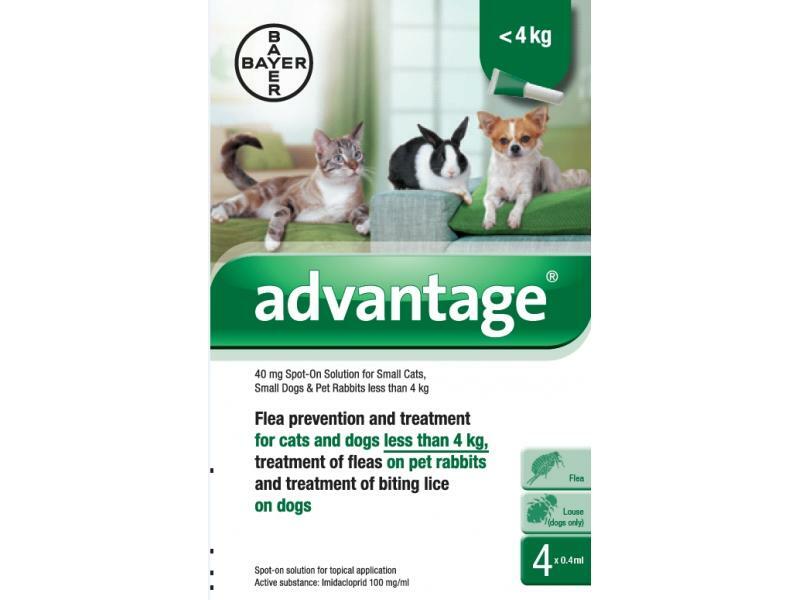 Advantage is one of the most effective and safe treatments to treat fleas on dogs, cats and rabbits. Available as a spot on, it is easy to apply and treats the whole animal. Advantage can be used on cats and dogs from 8 weeks of age, and on rabbits from 10 weeks. It is safe to apply to lactating females and doing this will treat the puppies or kittens as well as the adult. Poisoning following inadvertent oral uptake in either man or animals is unlikely. In this event, treatment should be symptomatic under veterinary medical attention. Imidacloprid is an ectoparasiticide belonging to a group of chloronicotinyl compounds. Chemically, it is more accurately described as a chloronicotinyl nitroguanidine. The pharmacological properties of imidacloprid are novel. The substance has a high affinity for the nicotinergic acetylcholine receptors in the post-synaptic region of the central nervous system (CNS). The ensuing inhibition of cholinergic transmission in insects results in paralysis and death. Due to the weak nature of the interaction with mammalian nicotinergic receptor sites and the postulated poor penetration through the blood/brain barrier in mammals, it has virtually no effect on the mammalian CNS. The minimal pharmacological activity in mammals is supported by safety studies involving systemic administration of sub-lethal doses to rabbits, mice and rats. In further studies, in addition to the adulticide flea efficacy of imidacloprid, a larvicidal flea efficacy in the surroundings of the treated cat or dog has been demonstrated. Larval stages in the cat’s and dog's surroundings are killed following contact with a treated animal. Oral studies in the rat show imidacloprid to be absorbed rapidly from the gastro-intestinal tract. Almost complete absorption (95%) occurs within 48 hours. Peak plasma concentrations are observed within 2.5 hours following administration. Tissue distribution is also rapid with the lowest levels recorded in the brain. The active ingredient undergoes extensive metabolism with only 10-16% remaining as parent compound. Almost complete (96%) elimination occurs within 48 hours, approximately 75% being removed by the kidneys and 21% with the faeces. The solution is indicated for cutaneous administration. Following topical application, the product is quickly distributed over the animal. Acute dermal studies in the rat and target animal overdose and serum kinetic studies have established that systemic absorption is very low, transient and not relevant for clinical efficacy. This has been further demonstrated by a study in which fleas were not killed after having fed on previously treated animals once the animal’s skin and fur had been cleaned of all active material. There are currently no questions for Advantage 40 Cats/Dogs/Rabbits Up To 4kg - be the first to ask one!